"The BEAST is back, the BEAST IN BLACK!" Haunting words recalling ‘’Berserker’’, Beast In Black's debut album, which was finally released in November 2017. Although it never actually felt as if the beast had been away entirely. Right after the departure from his former band Battle Beast, Beast In Black's founder Anton Kabanen recruited new companions in the way of high-pitched vocalist Yannis Papadopoulos (Wardrum), bassist Mate Molnar (Wisdom), guitarist Kasperi Heikkinen (U.D.O.) and last but not least drummer Atte Palokangas (Thunderstone), who officially replaced Sami Hänninen in early 2018. Continuing with the same style of songwriting that he started with Battle Beast, Kabanen crafted a new host of addictive songs that excite with their use of relentless energy and power. Especially the album's first single, ‘’Blind And Frozen’’, that blew the roof off and set the bar very high by achieving several million YouTube views in just a year. To cut it short: ‘’Berserker’’ was very well received by both new and old fans of Anton's work, as well as fans of the anime series Berserk, which Anton drew inspiration from. Additionally, ‘’Berserker’’ not only allowed Beast In Black to enter the hearts of many people all around the globe, but also gave them the keys to the gates of the world's stages! The accompanying touring cycle kicked off in October 2017 in the form of a few European shows supporting the legendary W.A.S.P. 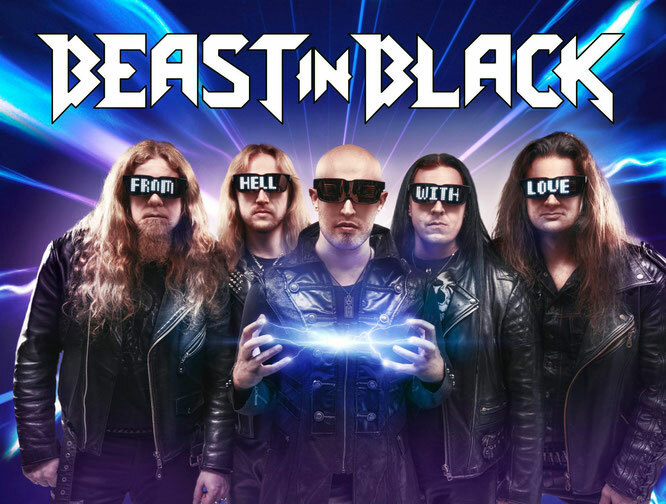 Beast In Black started 2018 with two sold out headlining gigs in Finland, the home country of Anton, Kasperi and Atte. But there was no rest for the wicked, as the group joined Italian symphonic metallers Rhapsody Reunion on their extensive 20th Anniversary Farewell Tour across Europe, where the band visited a number of countries and cities for the first time ever. The summer saw Beast In Black playing several festival gigs, many of which were in Finland. To worthily close the ‘’Berserker’’ live chapter, the band returned to where their live career had begun back in 2015 - supporting Finnish symphonic metal giants Nightwish in front of several thousand fans in November & December 2018. The band secretly forged 11 hot new tracks which comprise their highly-anticipated sophomore record ‘’From Hell With Love’’. 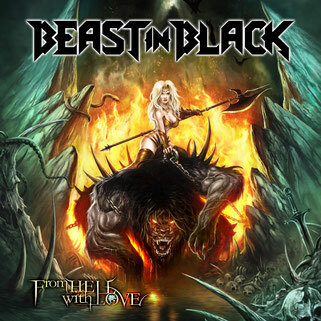 The album was once again recorded in Anton's own Sound Request Studio, and true to the motto "Never change a winning team", the cover artwork was created by Roman Ismailov who worked on ‘’Berserker’’ as well as the first record Kabanen wrote under the banner of Battle Beast, ‘’Steel’’ (2012). Although Beast In Black's new tunes musically fit into a similar vein as their debut album, the lyrics haven't only been inspired by the aforementioned Berserk, but also by other movies and TV series Anton is a huge fan of, as well as personal experiences once again. For example, ‘’Cry Out For A Hero’’ is based on another Japanese manga and anime series called Fist Of The North Star. Fans of Berserk have nothing to worry about as with the help of Anton's Italian friend Paolo Ribaldini the record still delves deep into Anton's favourite series! After seeing Beast In Black open for Nightwish in November 2018, I almost instantly became a fan of the band. ‘’Berserker’’ quickly became one of my most listened albums of that year and it still is until now. ‘’From Hell With Love’’ will be a fierce competitor for that spot. Even though I describe myself as a death metal girl, music with 80’s influences will never fail to amuse me. ‘’From Hell With Love’’ is no exception. Starting with ‘’Cry Out For A Hero’’, which is a super energetic, powerful, but most importantly a catchy track. Next up, title track ‘’From Hell With Love’’ is less power metal, but still incredibly melodic. ‘“Sweet True Lies’’ and ‘’Die By The Blade’’ were already released as singles and are my favourite tracks as well. ‘’Repentless’’ reminds me more of early power metal, just like ‘’No Surrender’’. ‘’Oceandeep’’ is a beautiful ballad which gives me the chills. Yannis’s voice is amazing, perfect for this kind of music and I can’t get enough of it. Both ‘’Unlimited Sin’’ and ‘’Heart Of Steel’’ are typical Beast In Black, which in my book is awesome. However, ‘’True Believer’’ doesn’t really do much for me, same goes for ‘’This Is War’’. Now don’t get me wrong, I still like the tracks, but they are not my favourite of this album. ‘’From Hell With Love’’ is a great sophomore album and I am so happy that Anton is back again with his insanely talented songwriting. It does not happen a lot that I can write a review in one sitting, let alone listen to an album in its entirety. It is simply brilliant. Thank you Anton, Yannis, Kasperi, Matte and Atte, for making music. But most importantly, thank you to my friend Jan, who introduced me to Beast In Black. (Pre) order the new album!